Heat the butter, ham drippings and brown sugar in a small saucepan over medium-low heat for 5 minutes, until it becomes a noticeably deeper shade of brown. Add the vinegar and continue to cook, swirling the pan a few times, for about 15 minutes, until the sauce has thickened to the consistency of thin maple syrup. Remove from heat and add a good pinch of both salt and pepper. For vegetarian preparation exclude ham hock and use roasted vegetable stock. Will need to increase salt by additional 1/2. In a large pot, combine ham hock, collard greens, and 8 cups water/stock and half of vinegar; bring to a boil. Reduce to a simmer, and cook until collards are very tender, 45 minutes to 1 hour. Remove ham hock, and discard. Add remaining vinegar, and season with salt and pepper. Serve collards with their broth, and, if desired, hot sauce. Season with salt, pepper and the bistro’s 14 spice blend or your favorite bbq rub. Place collars on hot grill and cook until meat is flaky and cooked through. Approx. 6-7 minutes. Watch closely to avoid burning. 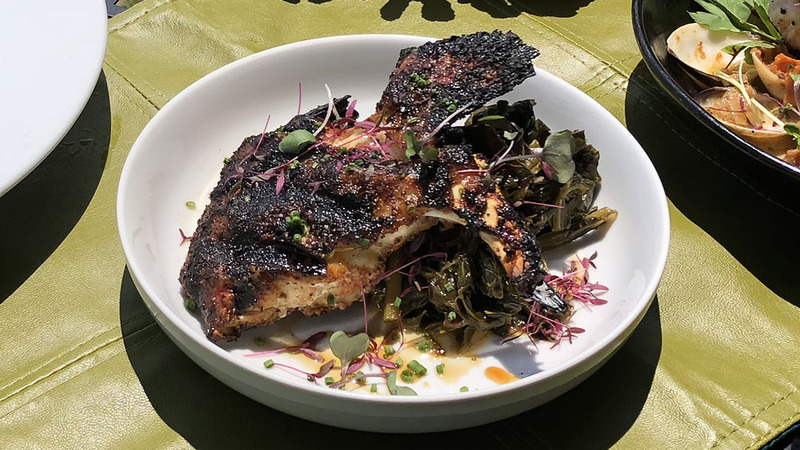 Place a small mound of collards in center of plate, top with grouper collar, and drizzle with ham gastrique. Enjoy while still warm.